It’s the time of year to start thinking about what you want to plant during the Valley’s cooler months. Right now, for butterflies, plant anything that’s blooming. Give them nectar and they will come! Busy nectar plants this month are crucita, scarlet sage, skeleton-leaf golden eye, heliotrope, passion vines, lantana and wild olive tree. Butterflies are everywhere, from dime-sized whites, blues, skippers and yellows to the big yellow sulphurs, queens and giant swallowtails. 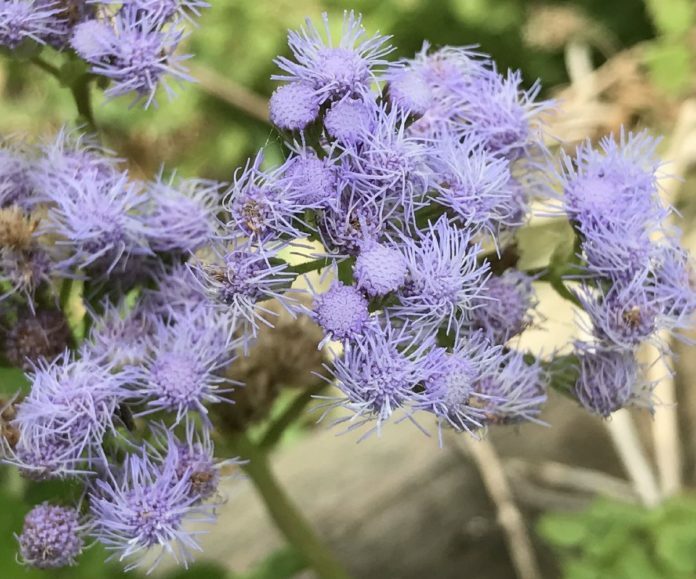 Two must-have native plants that attract butterflies during fall are skeleton-leaf golden eye, Viguiera stenoloba, and crucita, also called blue mistflower or fall-blooming mistflower, Chromolaena odorata [Eupatorium odoratum]. Skeleton-leaf golden eye is a tidy shrub that makes a beautiful tall ground cover. The shrubs, if left to grow as they please, can reach 3- to 4-feet tall with a spread nearly as wide. The lower branches will drape to the earth, providing shelter for snakes, lizards and small mammals. As a nectar-providing and seed-bearing plant, skeleton-leaf golden eye attracts butterflies, moths, bees and insects; granivorous birds eat the seeds. The dense growth often sports a bird’s nest. Plant in full sun to partial shade. It accepts a variety of soils, from rocky, to clay loam and caliche, but requires good drainage. Although exceptionally drought-tolerant, it blooms more profusely with irrigation. The aromatic leaves remain green through the winter. Shearing off about 6 inches of the spent blooms encourages more blooms. Tuck clippings and seed heads under the plants where they can benefit the soil and wildlife. Eventually, the lowest branches will need some attention. Prune them close to the shrub’s main stem; other branches will drop down and take their place, so you still have full-looking shrubs and critter cover. Skeleton-leaf golden eye is easily propagated by cuttings in late spring with the bright-green new growth. If skeleton-leaf is neat and shapely, crucita is its geometric opposite; however, it’s one of the most popular native butterfly nectar plants in the Valley. Crucita can grow four to six feet tall but eventually begins to sprawl. It can send spindly branches up small, near-by trees and shoot out its lavender flowers in unexpected places. Crucita can be trimmed back much like skeleton-leaf golden eye to promote a longer bloom period. Crucita also can bloom during the summer. That’s when it’s important to shear off dead blooms so there will be more flowers for the fall butterfly show. Other popular mistflowers are betony leaf mistflower, Conoclinium betonicifolium, which blooms spring through fall. It also is called Padre Island mistflower. A third mistflower popular in the Valley is blue boneset, Tamaulipa azurea, or spring-blooming mistflower. Fall-blooming mistflower leaves are longer and narrower than spring-blooming which has leaves wider at the base and more heart-shaped than fall-blooming. Padre Island mistflower leaves are thicker with slightly ruffled edges. Cruita easily self populates. After the flowers bloom, seeds are carried by the wind. Skeleton-leaf golden eye and mistflowers are perennials, nearly maintenance free once established, and excellent nectar plants to attract hungry butterflies. Anita Westervelt is a member of the Rio Grande Valley Chapter, Texas Master Naturalist. The organization provides monthly articles to The Monitor.